HIJACK > Food for your Ears > Hijackers' Tunes and Mixes > Le Monde EP from Wreckless - Out Now on AutomAte! 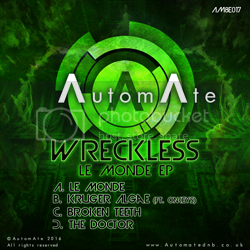 Le Monde EP from Wreckless - Out Now on AutomAte! Wreckless has been a firm AutomAte fixture since the labels’ inception. Music teacher by day, producer by night and dedicated to the cause, Wreckless embodies everything that is AutomAte’s M.O. Able to turn his hand to a variety of styles, from beautiful soundscapes to distorted filth, a very real emotion and level of human connection shines through all of his work. Wreckless releases on a number of labels and this, his first artist EP for this imprint, sees him once again save his toughest output for AutomAte. Opening track Le Monde sets the scene with a grid of tight kick drums providing framework for abrasive bass rips and a wriggling, squelchy 303 acid line. Next comes Kruger Algae, an absolutely storming piece of tech dnb featuring Onkeys; not for the faint-hearted or warm-up DJs, this cut destroys dancefloors. Next up, Broken Teeth slaps us repeatedly with cold, hard snares, keeping us permanently stunned as we float amid a stomach-churning sea of gnarly distortion. Finally, The Doctor delivers a hectic, highly strung vibe as a huge malfunction threatens the very fabric of space and time, giving us our cue to exit on the double!